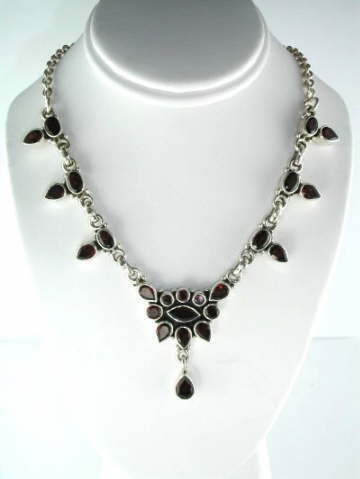 Beautiful faceted deep red, Garnet necklace in a classic 925 sterling silver setting. The lovely deep red Almandine Garnets found in this necklace are one of the many different types of Garnet found in the world today; each differing depending on their mineral base. Garnet is the name for a very wide and sometimes confusing group of minerals. Most, but not all garnets are red in colour. Grossular Garnets come in a wide range of colours and Uvarovite is always bright green. There are many other types of Garnet such as Pyrope, Spessartine, Almandine and Andradite. Almandine Garnets (the most commonly found red specimens in jewellery and the ones in this necklace) are linked with the Base or Root and Sacral chakras. The keywords with this crystal are stability, good health, trust, friendship, personal power and passion. An often overlooked crystal, due to its ready availability, these lovely stones promote friendship, balance and devotion. They can assist in developing a deep and enduring spiritual bond with partners, and where friendship is lacking can attract people to you. Wearing a piece also provides a constant monitoring/balancing energy between the physical and etheric bodies, and can also assist with Kundalini rising. Gorgeous Garnets have very uplifting, almost playful energy. Garnet in general is an energizing stone and is also an excellent chakra cleansing crystal. Passion, love, devotion and emotional harmony are all keywords associated with this crystal. They are also, according to Judy Hall in her Crystal Bible, 'a useful crystal to have in a crisis . . . in situations where there seems to be no way out or where life has fragmented or is traumatic'. Garnet turns a crisis into a challenge and brings courage, strength and hope.